But I did find a Costco participating in the green movement. 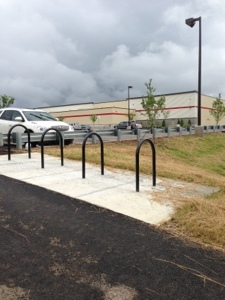 The new Knoxville, Tennessee, Costco is on a greenway. The photo shows the bike racks. For me, this conjures up pictures of bicyclists trying to get the paper towels home. "In Farragut, we require greenway connections for all of our new developments and so it's actually going to be great," Farragut Town Administrator David Smoak explained. "We're going to have a greenway connection from Lovell Road around the backside of the development into Kingston Pike so pedestrians don't have to go down to that busy intersection at the corner of Lovell and Kingston Pike." This was my first time in the Knoxville store, and I will definitely be stopping again. It's a easy reach off Interstate 40 on exit 374. Gas prices were fabulous. LOL. We live near this Costco and love shopping there. True, there are bike racks, although I've never seen a bike parked at one. To my knowledge the greenway does not come near the store, although I'm going to go around back and check myself on that. The regional biking program in Knoxville is very proactive and approaches business near this store (on the greenway in a major suburban development) to install racks. Good for Costco for installing them, although I agree that they don't lend themselves to carrying home the average haul. P.S. Re: the Town of Farragut, it's not all rosy. They do not allow Costco to advertise their gas prices outside the store on Kingston Pike or Lovell Road. This is probably to protect the local businesses, which is all well and good, but it's not pro-consumer. A way to research gas prices w/out having to call the store is to use the Gas Buddy app. on Android and probably iPhones. Costco is consistently the best price in the area, although they do not have 89 octane. I LOVE THIS STORE and am enjoying my membership. So glad they are finally here!